Flu season is in full swing. If you work in an office or you have kids in school, chances are very good that if you haven’t had the flu this year, you know someone who has. That’s why TSAOG wants to remind everyone about the availability of OrthoNow, San Antonio’s urgent care solution designed specifically for orthopaedic injuries. If you have a musculoskeletal injury (like a sprain, muscle tear, or broken bone), get to OrthoNow to avoid the increased exposure to infectious disease you’ll find at a generalized urgent care clinic or at the ER. The OrthoNow walk-in clinic from The San Antonio Orthopaedic Group is available at our Central location (400 Concord Plaza Dr, Ste 300, San Antonio, TX 78216) Monday through Friday from 11:30am-7:30pm and Saturdays from 9am-1pm. Since OrthoNow only treats orthopedic injuries, you get specialty care from the very beginning, including an accurate diagnosis and treatment plan, access to imaging and casting/bracing, and expedited follow-up care with one of TSAOG’s board-certified surgeons. Best of all, OrthoNow bills to your insurance as a specialty office visit, so you can avoid those costly ER copays! Broken bones aren’t contagious. That’s why when injuries happen, you should get to OrthoNow! Call 210.804.5424 to be seen today. Providing specialty urgent care without the souvenir germs is one more way TSAOG makes your health our mission. Dr. Christian Balldin presented his research to the Orthopaedic Research Society (ORS) on January 26th. The international meeting took place here in San Antonio and included many of the pioneers of orthopaedic research. Dr. Balldin’s research evaluated the dangers of notching, an accidental defect, in the hip joint during arthroscopic (minimally invasive) surgery. Notching can occur as the surgeon performs a procedure to remove excess bone in this area using a tool called a surgical burr. The excess bone is due to the underlying pathology of femoracetabular impingement. The notching is basically a divot in the bone. The area of the hip joint under review, the femoral neck, experiences great stress from weight bearing activities, so causing a defect can increase the risk of fracture to the patient. Dr. Balldin found that avoiding these defects during the technically challenging procedure of hip arthroscopy to be of the utmost importance. However, if notching does occur, the greatest cause for concern is when it occurs at a depth of 4mm or more. At that depth, Dr. Balldin found that the defect actually changed the biomechanical strength of the femoral neck as compared to the intact state (where no defect is present). Dr. Balldin’s research is currently under review for publication in a peer reviewed journal. Dr. B Christian Balldin is an orthopaedic surgeon, specializing in sports medicine, with The San Antonio Orthopaedic Group. He treats patients aged 3 years and up for all orthopaedic conditions, with a special interest in sports-related injuries and hip arthroscopy. To schedule an appointment with Dr. Balldin, please call 210.281.9595. TSAOG’s Dr. Christian Balldin spoke with Berit Mason at WOAI Radio on tips to avoid injuries now that soccer season is underway. The very competitive youth soccer season is about to open, and local orthopaedic docs say there are several steps you can take to make sure it’s not broken bone season, 1200 WOAI news reports. The Orthopaedic Group has opened Ortho Now, an urgent care clinic to examine sprains, broken bones and torn ligaments, avoiding the need to go to a hospital emergency room and wait for hours in a waiting room packed with flu patients. Dr. Balldin says the key to safe play is preparation before the opening whistle sounds. He says you should make sure you are in generally good health by sticking to a balanced fitness program during the off season. Also, he says, always take plenty of time to stretch, because ‘cold’ muscles are far more prone to injury. He says wearing the appropriate equipment is also important. He says the lower legs is where many soccer injuries occur. He says players should always look around to make sure there is proper equipment on the soccer field as well, including well padded goals, and a good playing surface. He says the soccer ball needs to be in good shape as well. “Soccer balls were made of leather and they were holding a lot of water and becoming heavy,” he said. So synthetic balls were created which remain light and less dangerous when playing on a wet surface. Dr. Balldin says it is also critical for the adult coaches in youth soccer games be knowledgeable enough to recognize injuries, to make sure a player is fit enough to return to the field after suffering from a minor injury, and to understand what to do on the spot, and to promptly take the child to Ortho Now in case of a major sprain or break. He says another key is not to try to play too many sports. This time of year, Dr. Balldin sees a lot of young people who are playing soccer, wrestling, and playing basketball, and that leads to ‘overuse injuries.’ But he says playing just one sport all year round is also dangerous for children and teens, so they should play different sports throughout the course of the year. Dr. Christian Balldin is an orthopaedic surgeon, fellowship trained in sports medicine, with TSAOG. He treats patients aged 3 years and up for all orthopaedic conditions with the exception of the spine. His special interests include sports-related injuries and hip arthroscopy. To schedule an appointment with Dr. Balldin, please call 210.281.9595. Beginning January 2013, Dr. Casey D. Taber will be seeing patients at our North Central / Stone Oak location on Tuesday mornings. This office is located at 150 E Sonterra Blvd, Ste 300, San Antonio, TX 78258. In addition to Stone Oak, Dr. Taber will continue to see patients in Downtown and Westover Hills as he has for years. Dr. Casey D. Taber is a board-certified orthopaedic surgeon, fellowship trained in sports medicine. He treats conditions of the shoulder, hip and knee as well as any sports-related injury for patients aged 14 years and up. His special interests include total joint replacement and hip arthroscopy. To schedule an appointment with Dr. Taber, call 210.281.9595. TSAOG’s Dr. Christian Balldin was interviewed by Jim Forsyth with WOAI on Monday, November 26th. A disturbing new study shows, perhaps thanks to the example set by discredited cyclist Lance Armstrong and other high profile athletes, teenagers are using more performance enhancing drugs. The study was published in the journal “Pediatrics.” It shows that of a random sample of middle and high school students tested in Minnesota, 35% of boys reported using protein powders, 6% reported using steroids, and two thirds reported changing their diet to increase muscle tone or size. 21% of girls reported using similar substances. 12% of both boys and girls say they use three or more of these substances. Dr. Balldin says the substances can be particularly harmful for teenagers, because the body at that stage of development is already ‘bulking up,’ naturally. “Most of the time, we certainly get enough protein in our regular diet as long as it’s a healthy, well balanced diet,” he said. Dr. Balldin agreed with the study, that the young people are growing up in a world where, especially for boys, visible muscles and other outward signs of strength are valued. Dr. Balldin says parents should be aware of the signs that a youngster is using these types of drugs. He says many times that show up in teenagers in the form of stomach cramps and nausea. Dr. Christian Balldin is an orthopaedic surgeon, fellowship trained in sports medicine, with The San Antonio Orthopaedic Group. He treats patients aged 3 years and up for all orthopaedic conditions with the exception of the spine. His special interests include hip arthroscopy and sports-related injuries. To schedule an appointment with Dr. Balldin, call 210.281.9595. TSAOG is very pleased to announce that Athletic Trainer John Carollo has joined our team! John Carollo has been working as an athletic trainer for 15 years. He completed his undergraduate degree in Athletic Training at Texas State University in San Marcos, TX and went on to attain a master’s degree in Medical Management at Ohio State University. In addition, he served 5 years in the US Navy as a Russian translator and is an Operation Desert Storm veteran. 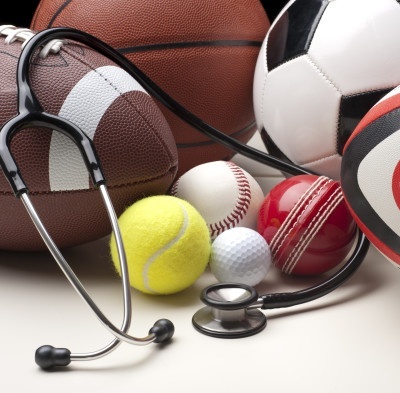 We invite you to contact John Carollo directly with any questions you may have regarding sports coverage requests or sports injury management. He can be reached at jcarollo@tsaog.com or by phone at 210.683.5749. Direct trauma such as getting hit with a lacrosse stick, a hockey stick, baseball or heavy object. Some collarbone fractures encompass more than one of the situations listed above. The less common fractures of the clavicle (those closer to the shoulder area) are more prone to not healing and need to be monitored closely. Many different ways exist to fix these broken clavicles. There are intramedullary devices that are placed into the canal of the clavicle. They do not seem to work very well in cases where there are multiple fracture fragments (pieces of bone). The most common way to surgically repair a clavicle fracture is to use a metal plate with metal screws. The vast majority of time the hardware remains in place and does not need to come out. However, there are instances when it is recommended to remove the hardware. All of the possible risks have a low chance of occurring but something to be aware of when discussing the treatment options with your orthopaedic surgeon. Any time our physicians have something to say about an issue facing TSAOG or our community, we ask them to BLOG about it. Starting today, when our patients have something nice to say about TSAOG, we’re also going to BRAG about it. We encourage you to review and rate your experience with TSAOG. The next time you visit us, please take the time to fill out our customer survey and you may see one of your comments online the next month! Dr. Christian Balldin of TSAOG spoke with Jim Forsyth on WOAI radio this week to discuss a new study, which states that despite increased media coverage of concussions, many high school athletes choose not to report concussion symptoms for fear of being excluded from play. See the whole story below. Despite new emphasis being placed on avoiding concussions, and new UIL rules requiring specific precautions be taken if a concussion is taken, a new survey shows one third of high school football players are still ignoring or covering up concussion symptoms. The reasons: they are afraid that coming forward will result in being excluded from the team, or that they will be considered to be ‘soft’ or a ‘crybaby’ by coaches and fellow players. “Parents as well as athletic trainers and coaches all need to be aware of the repercussions of concussions, and especially of a second concussion very soon after an initial injury,” Dr. Christian Balldin, orthopaedic surgeon with the San Antonio Orthopaedic Group. Researchers found that 32% of high school football players said they had clearly concussion-like symptoms, like headaches, confusion, or vomiting, but did not seek medical attention. The National Football League has been working to raise concussion awareness, and new UIL rules stipulate that teenaged players who are suffering from concussion symptoms be removed from play and cannot return until they have been cleared by a doctor. But Dr. Balldin says the key is for coaches and trainers to make sure young players are aware that getting a concussion will not mean the end of their season. The NFL is being accused in a class action lawsuit with allowing players to continue to play with multiple concussions, leading to dementia and other long term health problems. “Some of the signs are simply headaches and dizziness,” said Balldin, who is team physician for Our Lady of the Lake University’s athletics program. Dr. Christian Balldin is an orthopaedic surgeon, fellowship trained in sports medicine, with The San Antonio Orthopaedic Group. He treats patients aged 3 years and up for all orthopaedic conditions with the exception of the spine. His special interests include sports-related injuries and hip arthroscopy. To schedule an appointment with Dr. Balldin, call 210.281.9595.